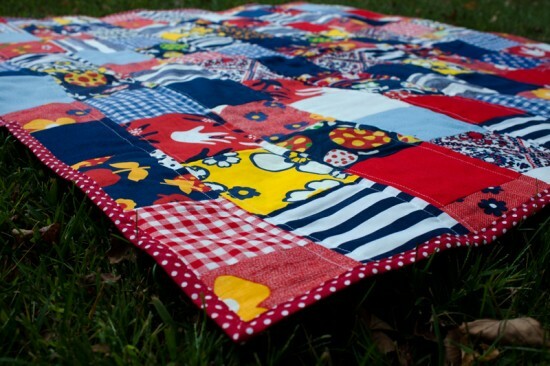 I know I said it was time for the next quilting project… but I bet you didn’t think it would be done already! Back in June (eep!) 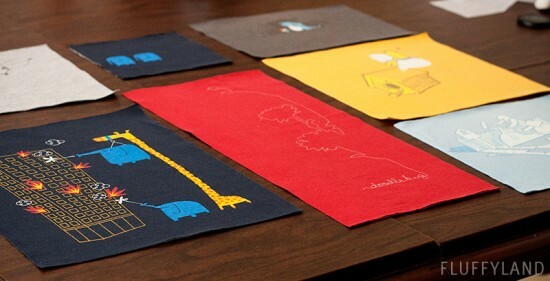 I was asked by Catherine of Mapology if I’d like to test one of her new map fabric prints and blog my finished project. I had maps on the brain already, with trips to Alaska and Germany in the works for the summer, so I couldn’t refuse. My initial plan was to create a sort of “where I’ve been” map, with either embroidery or special pins to mark out and color in the corners of the world I’ve visited. 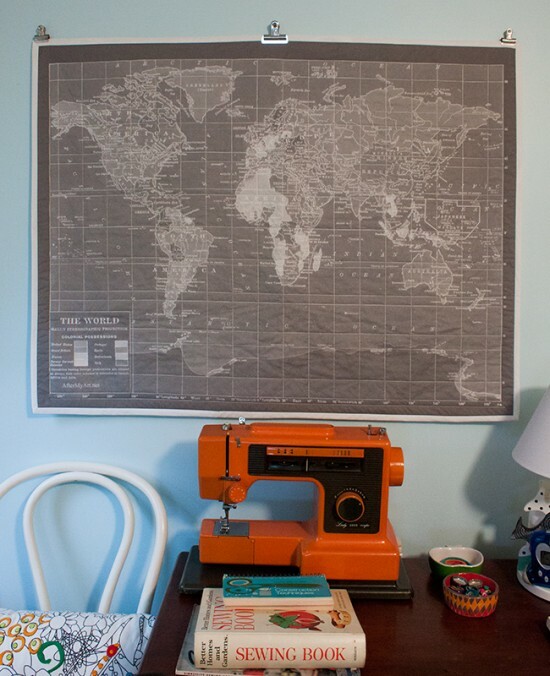 With this in mind, plus my love of gray, I selected a minimalist gray world map. I wanted to stretch it over a frame, like a canvas. All of this changed when I got the fabric. First, I hadn’t thought of the fact that a vintage map might not be the best for marking travel, because maps are frequently changing and this one definitely had some alternate boundaries to today’s world map. Second, if I wanted to stretch it over a frame I’d have to make a frame. Not hard, but a bigger project than I wanted to tackle with so many other projects in the works. Third, and most importantly – this projection has perfectly straight longitude & latitude lines – perfect for quilting. It was time to keep it simple, and let the map show itself off. 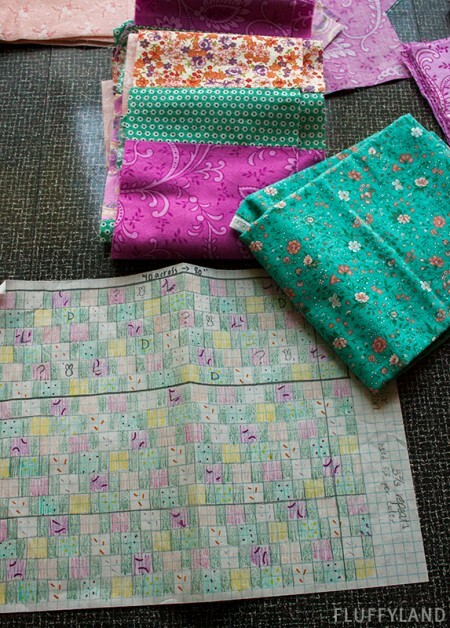 Plus, I didn’t want to lose my brand new quiltmaking skills! Click through to get a quick rundown of my quilting process! All pieced, quilted, trimmed, and bound! 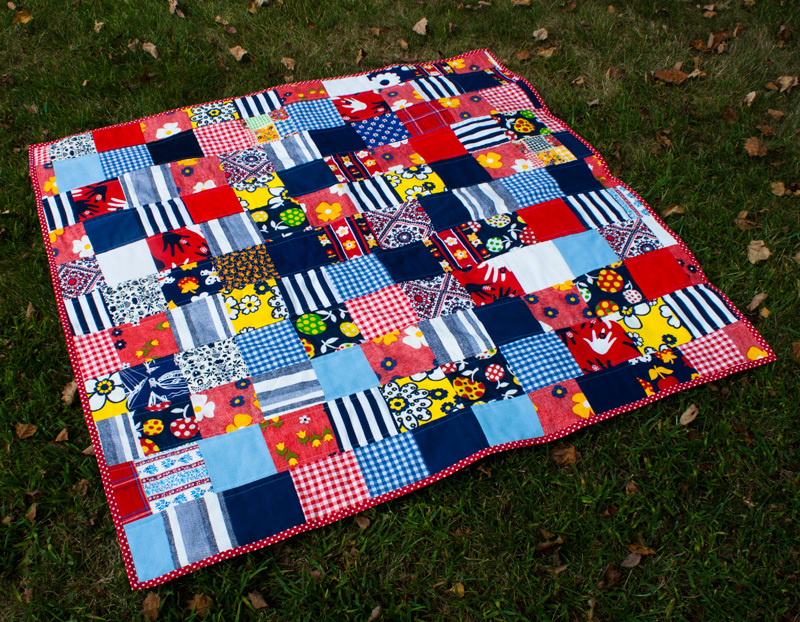 Decades after the original squares were cut, Aunt Jeanie’s Quilt is finally done!